As I am a practicing medium, I can see ghosts, ET’s, ultra terrestrials and other anomalous entities every day. I go into a state of deep meditation where I leave my body traversing my conscious self so I can coexist and communicate with them on a nonphysical plain of spiritual existence. Therefore, the entries in my journal that I have recorded reflect those occurances that I didn’t provoke myself. 2009 during the winter: I was dating a girl, who like myself, was very spiritual. One night I was home alone at my house and something told me to go outside. I was receiving some kind of message, so I listened to it. Then I started thinking about how cold it was but I went outside anyway. My attentions were then pulled upwards towards the sky. I saw a triangle of stars directly over head. I continued to stare at this triangle. Before too long one of the stars started to move. It would drift a significant distance, then it would snap right back into place reforming the perfect triangle. This went on for at least a half an hour. Stars don't visibly move at that pace if in fact they are actually are stars. I then began to text the girl I was dating and she was already outside watching the same thing I was. Curious it was for many reasons. First it was cold outside and it was around 11:30 p.m.. We both had to work the next morning. And ironically, we both saw it at the same time. We both realized we had seen a UFO. This was the first time that I honestly could say that I saw a UFO. It contacted her and I by placing thoughts in our heads to go outside at the same time. So not only did I see something I couldn't explain, an other worldly intelligence also communicated with me. October 05, 2013: I saw a UFO 3 times at night with orange and white flashing lights. It took an impossible dive after flying straight then leveled out twice in the exact same spot and then did the same move in the exact mathematical opposite side of the sky. October 20, 2013: I saw a shooting star on Lake Butler Road (Orlando, Florida) fly right over my car then disappear. October 28, 2013 4:41 p.m.: I saw a UFO. November 01, 2013: An alien was in my dream. He grabbed me then raced with me paralyzed and tried to throw me out the window. I prayed to God in my dream and right before I was going to be thrown out of the window he set me free. I took it as a positive sign of protection. November 12, 2013 5:59 p.m.: A light emitting object resembling a plane about mile away came towards me then did an unorthodox zig zag left, then right hand turn and then faded from my view. This maneuver was impossible with our current day aeronautic technology. This occurred from my front porch vantage point. November 18, 2013 6:30 p.m.: I see a flashing light. At first looks like a plane then it started doing unorthodox movements that conventional aircraft is incapable of performing. Now it's on my radar. I start following multiple flashing lights moving in the same fashion I then I see what appeared to be drones circling around following the lights. This must have gone on off and on for over an hour. Drones chasing UFO's, and I was selected by some intelligence to bare witness. I knew I had to start creating my own personal historical record of such occurrences. January 2014: There were so many UFO sightings in Beijing, China and Bremen, Germany at their international airports that they had to shut them down for a time. January 29, 2014: Late at night the printer went off. It didn't actually print anything, but the mechanism that holds the ink cartridges was moving back and forth. This has been going on for many years. It's the ghosts way of letting me know that they are here. February 01, 2014. I saw an incredible rainbow. It was a gateway to the gods, a rainbow bridge. Ironically, when I saw this inter dimensional rainbow, I had just started watching an hour long show about aliens and stargates on my DVR. The next thing I knew, the whole episode was over. I had only taken a half a dozen photos near the beginning of the show. I must have lost at least a half hour or more in a time capsule vortex. February 01, 2014: I had a dream while I was sleeping at a friends house. I was looking out her bedroom window and started seeing multiple varieties of UFO's. Discs even cigar shaped ones. February 04, 2014 6 p.m.: I saw a flat orange line horizontal on the horizon. The line was divided into maybe 8 or 10 equal illuminated parts that moved. I saw it multiple times. Sometimes it was stationary, sometimes it was moving back and forth and then ducking behind a cloud and then it just vanished. February 18, 2014 between 5&6 p.m.: I looked towards the setting sun and saw a sphere dancing in and around the suns glare. February 27, 2014: I woke up hearing my printer going off. March 06, 2014: I woke up hearing the printer going off. April 05, 2014: The printer went off twice in the morning. June 21, 2014 approximate 6:30 p.m.: Sitting in my back yard I see a bird like creature land on my neighbors roof. Does it not predictably figure that this event happened me on the summer solstice? It then folded itself into black rectangular metallic looking object. Curious, I begin staring at it. Apparently it was staring back as one single light began emitting from it. I witnessed the light illuminating for the very first time as it went from no light to dim to bright. Now I'm even more focused on it. I approach it from my yard and take a few pics of it. I sit back down and I'm locked in fixated on it and then the light goes out, a few seconds later the light illuminates again. Now I'm tripping hard. Something under intelligent control is watching, lets use the term, spying on me. It was either made completely of some metal or alloy and or it was a cyborg. Now I start to think, who or what sent it? Who's conducting surveillance on me? It wasn't acting on its own. Some being or group of beings, either human or nonhuman, made a decision to send this drone to land on the roof of my neighbor which faces my favorite back yard chair, my throne and watch tower beneath the stars knowing that I'd be there at that time on that day. Half the time I stay the night at my friend's house. This night some power knew I'd be there. This power knew of my work schedule because I worked earlier in the day. It also knew that I'd be home that afternoon and evening and not at my friend's house. How is this possible? Are ET's reading my thoughts and my mind?Are they tracking my brainwaves and movements? I say yes and that this is either advanced mental capacity at work and or basic technology to them. I concluded that it was sent by an intelligence not of this world. Our govt is dumb, but they'd try to be more covert than this operation. This object guided by whom ever wanted to be seen. My neighbors and their grand kids were all watching it from their yards as well. Other neighbors besides myself were photographing it too. It was there all night with its emanating eye of light staring at me and my property. I sensed it had an on board computer analyzing me and all my movements live while I was outside and even through the walls of my house while I was inside. A sense of calmness and comfort embraced me as I searched for the source and purpose of this object. I knew not to be afraid. Any way early the next morning it was still there as the dawn of a new day shined upon me. I noticed it was still compact in its rectangular black metallic posture perched upon my neighbors roof however the light had been extinguished. I checked again around 11am June 22 and it was gone. July 8, 2014 from 9:00 p.m.to 2:00 a.m.: I see a UFO. It was round in shape. It had no lights emitting from it however it was still very visible in the night sky. The craft would creep towards me. I began sending thoughts to it as it drew closer. Once it was a few hundred yards away it would fly away but never out of my sight. It would then begin its approach again. This pattern must have occurred 25 or more times slowly. It was definitely under some form of intelligent control as it traveled at a curiously low rate of speed. A number of times it got within a few hundred yards of me almost directly over head. This object was doing some kind of research and analysis on me. I sensed on board computers were recording every thought, emotion and movement I made. I remember praying and asking that if I did get abducted that the experience be positive and benevolent. I was almost very scared a few times but I remembered that I am always protected. I communicated with the craft and its occupants telepathically the whole evening. I wasn't able to receive anything from it but I know it could pick up on me and interpret my thoughts. This went on until 2:00 a.m.. I was tired and went to bed. The object was still there when I retired for the evening. I never stay up that late but I must have had some et energy pulsing through me to remain awake for that long. The ET's must have sent this energy to me to keep me awake that long. July 11. 2014: I'm sitting outside on my front porch. It just rained so it actually feels cool and nice outside. I look down and this ant is biting my bare foot and I kill him. I'm an ordained minister and I love all loving creatures but I quit feeling bad about killing bugs that can potentially hurt me and others. I morphed inter dimensionally just then realizing that on another plain of existence my less evolved small insectiod self was biting someone something else at the same time. Or maybe me and my other dimensional self came in contact and I, the insect, actually bit my human self. July 17, 2014: I got home around 9:15 p.m. from work and went outside in the back yard. I saw the same UFO I saw on July 8 for five hours. This time the experience is much less eventful. I see the round in shape object slowly approach me and then back away multiple times just like before. I sent loving and welcoming thoughts every time. I know it's receiving and understanding me. It seems to me that the powers governing this vehicle and its occupant(s), are not allowing it to engage in an open commerce with me. However, it didn't stop it from abducting me. I don't remember going to bed and I woke up at 12:30 p.m.. I never sleep in that late. Upon awaking, I was overly and curiously exhausted all day. It took me about 24 hours to shake it off. July 19, 2014: I had a friend over. We were discussing FREE, the Foundation For Research Into Extra Terrestrial Encounters, founded by Dr. Rey Hernandez and an elite panel of PHD’s and other experts. I mentioned that one day, I would be at the A circle, round table discussions with Rey and his panel of PHD's. At that moment, we both witnessed a flash of light, which resembled lightening striking, followed by the silhouette of a human like alien. It only lasted a few seconds, but we both saw it. This entity reappeared multiple times over the next hour. July 28 & 29, 2014: I see what I believe is the same UFO I've been capturing with my eyes in the night sky for a number of months now. It displays the same behavior as before, it gets closer then it backs away. I've concluded it's a remote probe. It's either manned by a single ET, or it's totally mechanized. I can feel an intelligence behind it as it conducts surveillance on me. My thoughts, brainwaves and metabolics are all being measured and recorded. I invite even more of this activity. August 08, 2014 close to midnight: I'm in my back yard watching the skies and I see a round white lit object flying towards me. As the sphere draws near, maybe a half to a quarter of a mile away, it simply vanished. I went to get my small camera but it wouldn't turn on even with a charged battery. The next morning, of course, it turned on with no problem. I'm going to get a new nice camera that has a lens also designed for night photography. My current camera is not good enough. 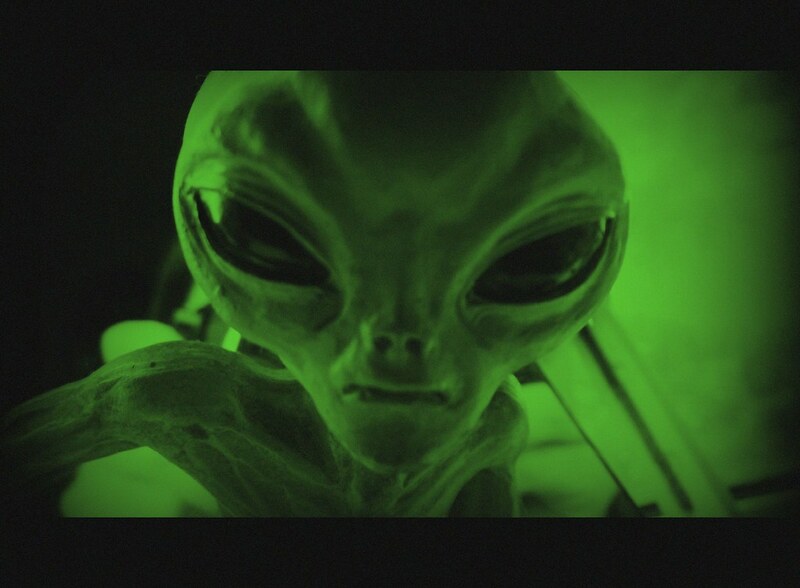 That being said, it doesn't mean that the aliens won't jam the new camera as well. I'm going to keep trying. One day I'll get some remarkable photos. August 13, 2014 10 p.m. to 11:30 p.m.: I see that alien probe again. It tends to stay stationary until I really stare at it. Once I dig into it visually, it starts to move until it's directly over my head. If I look away for a time, it will go back to it's original orientation in the night sky. This went on for an hour and a half. I was outside for over 2 1/2 hours before I even located it for the first time. On 08/11/14, I was outside for hours and didn't see anything. It's usually there watching me but not every night. August 18, 2014 Between 10:00 p. m. to 2:00 a.m.: I saw multiple probes and circular UFO’s all night long. I could go into detail but I’m not going to. It would take far too long. This night was reminiscent of other encounters I chronicled above. August 23, 2014 Around 10:00 a.m.: The printer went off multiple times right in front of me, letting me know once again that the spirit world is alive and well. This is always a powerful sign that the spirits are with me and want to make themselves acknowledged. August 25, 2014 9:00 p.m.: My friend, Shawn Bates, came over and we were hanging outside in my backyard. We were charging up my new video camera and started seeing unexplained lights in the sky. We couldn’t tell exactly what we saw but we saw anomalous night lights that were unidentified. By the time the camera was charged, the lights were gone.